Home Blog When Did Mourning Begin? Until a time machine is invented, a lot of questions about human culture have no solid answers. Behaviour doesn’t leave fossils, so archaeologists and other researchers have to rely on indirect evidence. When an ancient skeleton is discovered in a grave with pierced shells or wild flowers, we can guess at a funeral ceremony, perhaps with prayers to the spirits or magic spells to help the soul of the departed. But although we don’t know the exact details, what seems certain is that ancient humans mourned for the dead, treating their bodies with respect and ensuring that they were protected from wild animals and the elements. But when did humans first begin to behave like that? We can try to answer that question by looking at our closest living relatives: the chimpanzees. Thirteen million years ago or so, we were the same species. Then we slowly separated and humans began the long climb away from life in the jungle to the moon landings. The way chimpanzees live and behave now must say something about the way our ancestors lived and behaved in the very distant past, before the evolution of language and the regular use of tools, clothing and fire. So how do chimpanzees behave towards their dead? Is death something they don’t care about or quickly get used to? No, in many cases researchers have found quite the opposite. Chimpanzees seem to have a simple but strong understanding that death is something unusual. In Zambia, for example, researchers saw chimpanzees quietly gather around the dead body of a chimpanzee whom the researchers had named Thomas. The other chimps softly touched and sniffed Thomas’s body, as though they were trying to work out what had happened to him. Then one of them tried to clean his teeth with a stem of grass. Social interaction, touching and play are very important to chimps, but Thomas wasn’t reacting to anything they did and their movements were careful and quiet, quite unlike the usual lively way in which chimps behave towards each other. It appears, then, that they were mourning Thomas, accustoming themselves to the idea that he wouldn’t be part of their troop any more. They didn’t try to bury him or cover him with leaves and branches, but that kind of behaviour might come next, if chimpanzees evolve more intelligence and deepen their understanding of death. Among other chimpanzee troops, researchers have seen other responses to the end of a troop-member’s life. Some living chimps have struck a dead body, as though they’re trying to wake the chimp who has died. Or perhaps they are angry that someone they have known for so long has left them. Human beings can react like that and often feel guilty about it. 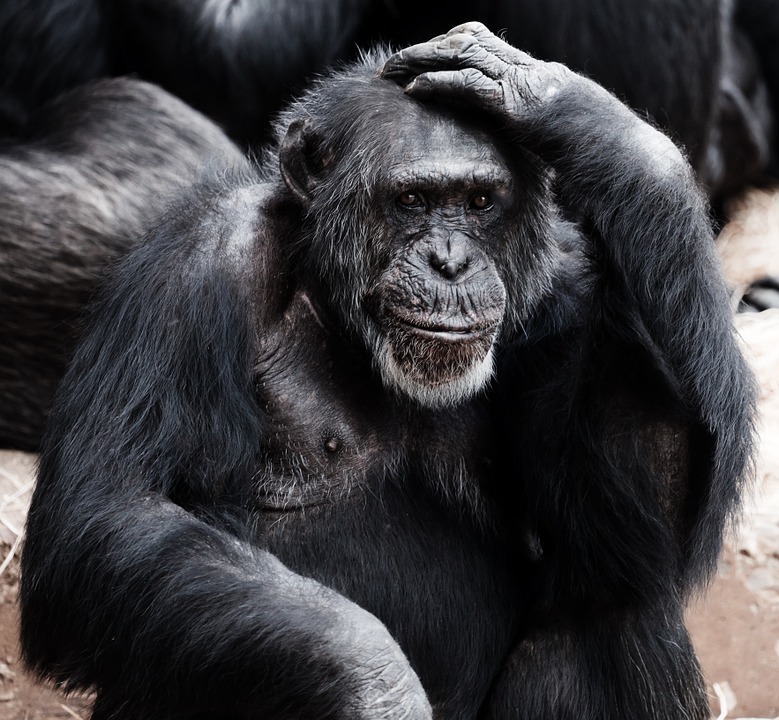 If chimpanzee research is anything to go by, they shouldn’t be: the response is perfectly natural and may have been happening for millions of years. Chimpanzees are upset by death in another way: they can feel anger towards a predator like a leopard when it kills a member of their troop. Their reaction is noisy and even violent. But when a fellow chimpanzee dies of disease or old age, their reaction is usually quiet – you can even say thoughtful. When an elderly female chimpanzee called Pansy was nearing the end of her life in a Scottish safari park, her fellow chimps became quiet and began to groom and caress her more often, as though they were comforting her. When Pansy finally passed away, her daughter Rosie stayed with her mother’s body all night. And for days all the chimps avoided the place where she had died, even though it was a good place to sleep and rest. It’s clear that chimpanzees and human beings behave in many similar ways when they lose someone they have known.